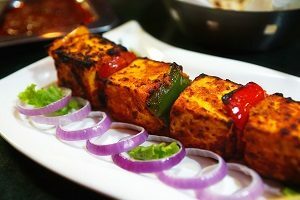 Kadai paneer is a slightly spicy and tangy gravy mix of cottage cheese which is mostly cooked with farm fresh tomatoes, freshly ground coriander and dry ground red chilies in a Pan (kadai) garnished with cream and corrinder leaves. 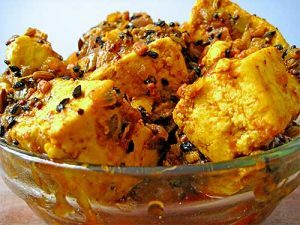 This is a famous dish in North India among vegetarians. Heat ghee in a Kadai(Pan) and saute the cottage cheese pieces till golden brown. Keep the paneer aside soaking them in water. Saute the bay leaf, cloves, cinnamon sticks, onion paste and ginger garlic paste till it is turned in to golden brown color in the same pan. Add 2 Tablespoon of cream at the end. Stir the cream gently in the gravy(optional). 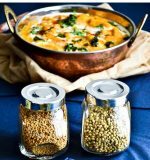 You can Serve kadai paneer gravy with naan, rotis, steamed white rice or jeera rice.